Played end for the Bears from 1932-1936, also played for the Philadelphia Eagles from 1937 to 1939 and the Phil-Pitt Steagles in 1943. Last player in the NFL to play football helmetless. 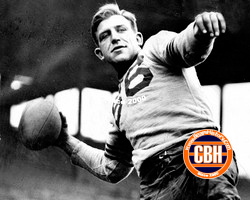 According to Hewitt's bio in the Chicago Bears Media Guide, he designed the jump pass play that won the Bears the 1933 NFL Championship. Pro Football Hall of Fame class of 1971. Died in a car accident in 1947.